As the summer 2015 barbecue season rolls along you’re probably looking for new ideas, recipes, tricks, tips, and techniques to up your barbecue game. Well, we’ve got great news… we’ve searched high and low to find you the top 13 best BBQ YouTube channels for summer 2015. And after you’ve read this entire article and watched their videos, show these Pitmasters some love by sharing this article with your friends on Facebook and else where. Your host Pitmaster Bill West located in Charleston, SC and Pitmaster Jack Waiboer from Carolina Pitmasters guide you through some amazing BBQ experiences. You’ve probably heard of a barbecuing a “whole hog” right? You might have even done a whole hot yourself. Well, below you’ll find one of their most popular videos shot at Bovinova event where they barbecued an entire cow, very cool! Your host Pitmaster Malcom Reed, after years of competing with his team, Killer Hogs and winning numerous awards and championships, he made the great decision to share his love of barbecue with competition barbecue secrets, barbecue recipes and even behind-the-scenes footage at competitions. Your host Pitmaster Greg is all about traditional “Low N Slow” barbecue and grilling. But you will also find recipes that are traditionally cooked indoors prepared on the grill with a Ballistic BBQ twist. He also has an extensive list of burger recipes you may want to check out. Your host Pitmaster Jason King has some excellent step-by-step walk-through barbecue recipes. He shares a lot of valuable information regarding barbecue tools, grills, smokers, sauces, rubs, cooking methods, and much more. Check out Jason’s work below in this Volcano Potato recipe which looks absolutely delicious! Your host Pitmaster Andy Wasserman of www.smokeandgrill.com gives out some golden nuggets of BBQ advice and says his main goal, while having fun cooking, is to share some of the things that he’s learned in his backyard, in the kitchen, and judging KCBS BBQ events. Your host Pitmaster Allan Johnson shares his passion for cooking which allows him to spend time with his family and friends while enjoying barbecue. Allan shares some very modern BBQ information in his videos. Your host Smoky Ribs Pitmaster does an awesome job walking you through some great recipes and tutorials in southern barbecue, Gulf Coast seafood, Cajun cuisine, and much more. Your host Pitmaster Aaron Franklin is what we like to call a barbecue scientist. He runs one of the most popular barbecue joints in all of Texas that sports a lengthy line daily that is commonly referred to as the “cult of Franklin”. Aaron was called the smoker of the best barbecue in the country by Bon Appetit, and more recently won Best Chef: Southwest honors at the 25th annual James Beard Awards 2015 (this is like the culinary-world equivalent of an Oscar) magazine not long ago. 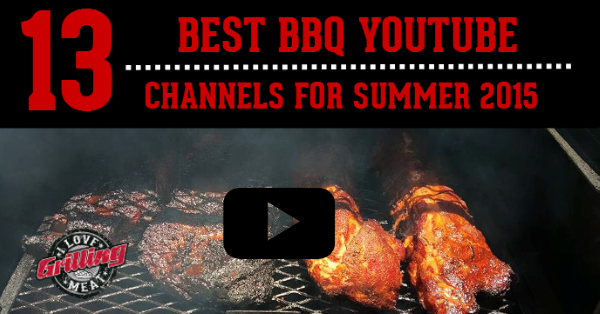 There you have it barbecue lovers, your top 13 best BBQ YouTube channels for summer 2015. If you have any special requests that you’d like to see from any of these 13 pitmasters, please feel free to ask in the comments below and we’ll forward the message to them. Also, remember to show these guys some appreciation for the value that they share by sharing this article on Facebook and other social media using the social sharing buttons around this post. How To Build Your Own Mini Smoker by Smoked Meat with Jef Sometimes a full-sized smoker is just so much. Maybe you live in an apartment, you want to go tailgating or camping, and need something smaller or portable. Today Jef will teach us how to make our homemade smoker for under $90. Five Guys Burger Recipe by BallisticBBQ In the last post we got a little exotic with “The Slav” deep-fried burger recipe and this time we’ve decided to keep it simple with an All-American classic cheeseburger in my version of a Five Guys burger recipe. Super easy to make at home with the same results as the original. Check out my videos on facebook and YouTube !!! Will definitely check out your channel Christopher! I’ll send you an email also so that we can be in touch and maybe collaborate on some projects. We appreciate you! Great to see you putting yourself out here on video online Jim! Leave a link to your channel so we can check it out. On another note, I’ll be sending you a private message later with some ideas you might be interested in. I look forward to talking with you. Hey Rick Gelly thanks for dropping in. BBQ Pit Boys are great and we love their videos however when we reached out to them for commentary and a few questions they didn’t respond so didn’t include them. Awesome, some of my good friends are on this list! I also do some great BBQ.